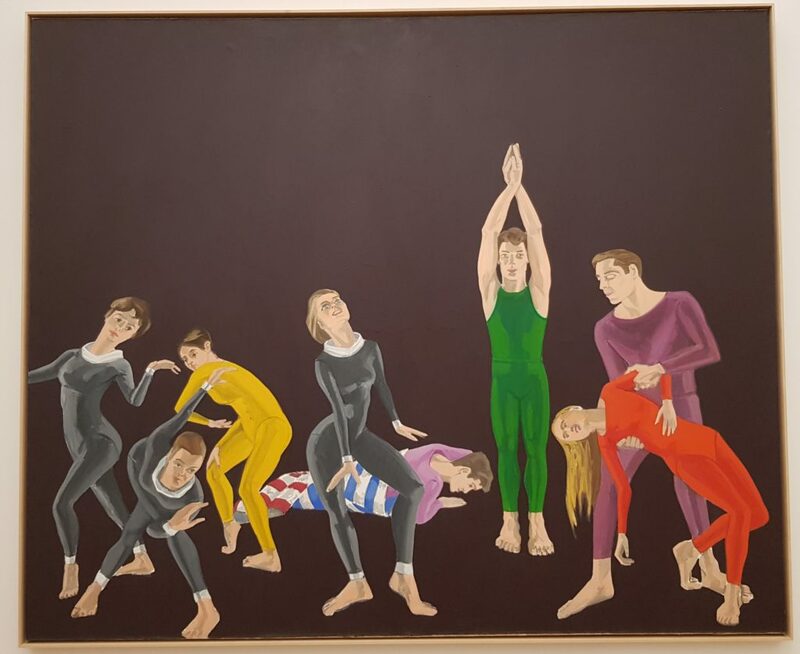 An exhibition off the beaten path at Haus der Kunst in Munich. I recently discovered this artist and his incredible work. A discovery that does not leave indifferent, quite on the contrary. First of all, the facade of the museum is completely covered and transformed by the hand of the artist. This already triggers my curiosity. 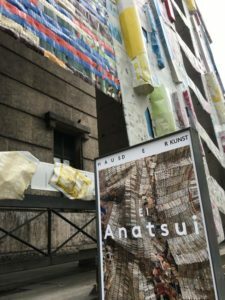 Once in the Haus der Kunst, we enter the first room and immediately we have the impression that a huge majestic drapery fell on the wall. We turn our heads to the left, and we have the impression that a huge net and its shells are hanging. Two absolutely unexpected impressions for me. 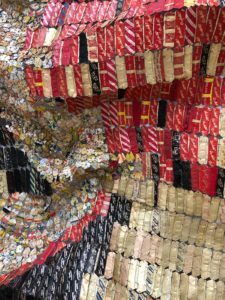 We approach, curious, and we realize that the sections of fabric, like tapestries, are nothing other than bottle caps, cans and aluminium pieces, collected, cut, hammered, folded, twisted and assembled with great care. The same on the other side with shells, plugs folded in another way, is just as beautiful. The illusion is perfect. 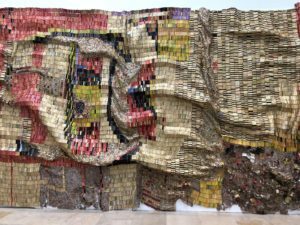 Arriving in the central hall, a labyrinth faces us, the artist invites us to walk inside, be close to his work and by making so, we change perspective. 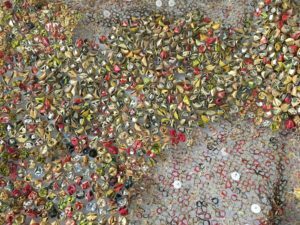 In the different rooms, we discover other facets of the artist, other materials with which he experimented. His use of wood, but also ceramics. Indeed, he begins in 1976 by modelling the ground, breaking pots, then glueing them together, a metaphor of the African society. 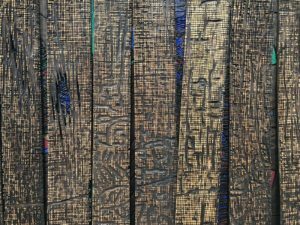 What particularly caught my attention was his work on wood, recovered in the street, pieces of furniture, thrown away drawers, broken, dislocated… He cuts, polishes, burns, paints these pieces of wood. By unifies them, he is forming an artwork. 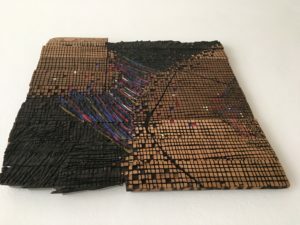 What is most remarkable is that all his works of art, are transported and made up of several pieces, then reconstituted always in a different way so that no exhibition is identical to another. This gives a certain movement, a freedom to the artist. The work is not static, it lives. 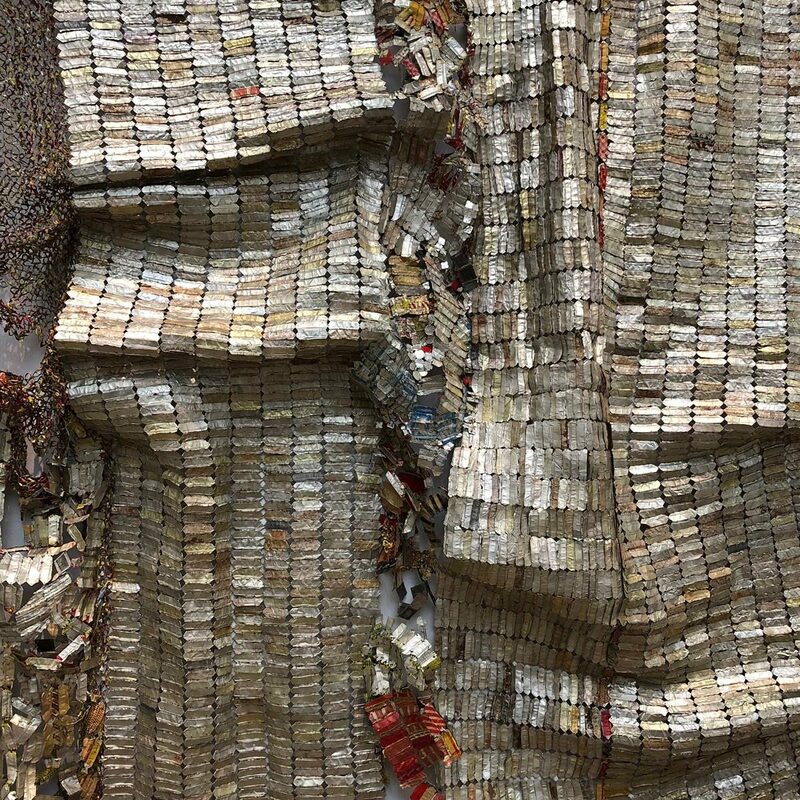 El Anatsui learned through the last five decades to master sculpture, painting and assembling. All his work is very committed. For me, it carries a message that goes beyond African society. Using all these objects or pieces of torn things that no one wants, gathering this rubbish to finally unite it and make something beautiful with it. 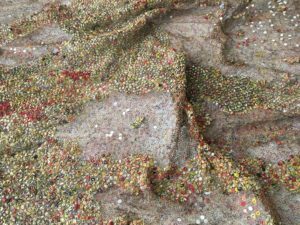 Creating a work of art with shimmering colours, sublimating these little bits of nothing and letting them exist, it is simply magnificent and inspiring. I see our history in it, I see hope and more. I hope you will have the urge and the chance to discover this artist if you haven’t done so already. 100 years ago a great artist died. By which I do not mean Leonard Bernstein, Gustav Klimt, Karl Marx or Ingmar Bergmann. Following the just passed world women´s day, I decided to write about a woman: the composer Lili Boulanger! Just a couple of days ago, I was talking about Lili Boulanger and how she is rarely performed on stage. 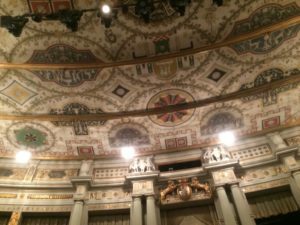 Then I happened to go to a concert at the Prinzregententheater in Munich. Romantic composers were on the programm: Janine Jansen played Robert Schumann, Clara Schumann and César Franck. Jansen played great. She found the perfect tempi and gave the violin a very soft sound, combined with strong outbursts. The audience was absolutely quiet and applauded frenetically. So, she played an encore. And: surprise! It was the Nocturne by Lili Boulanger. As if I would have guessed. The young composer Lili Boulanger wrote this piece in 1911, at an age of only 18. She wrote it just before she even begun her formal studies in composition and finished it in just two days. It still is one of her most famous works. The composer was born in 1893. Her musical talent already showed at an early age. By the time she was six years old, she was sight-singing songs with the composer Gabriel Fauré at the piano. She also studied with her older sister, Nadia. Also, her parents brought musical education to the family. The young woman composed only a very few oeuvres and died far too early, in 1918, only aged 24. 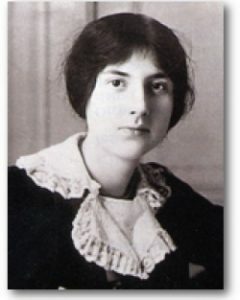 Lili Boulanger was widely influenced by the composers Claude Debussy and Richard Wagner. In the Nocturne, everything relates to both of them. She definitely took the first few notes from Debussy’s “Prelude à l’après-midi d’un faune”, and inserted them into her own composition. Also, she used short phrases from Wagner’s Tristan. However, the Nocturne is a brilliant composition by the young composer. The Nocturne was first written for flute or violin and piano but has been orchestrated in a following version. Unfortunately, the orchestral transcription was never published and has been lost. In 1912, one year after the Nocturne, Boulanger won the Prix de Rome. Shortly after that, she became very ill. She suffered from chronic illnesses, beginning with a case of bronchial pneumonia at age two that weakened her immune system, leading to the “intestinal tuberculosis” that ended her life at the age of 24. What impact Lili Boulanger’s work really has, is hard to say. But when Janine Jansen played the last notes of the Nocturne, the whole audience was enchanted. And this is a good enough reason to look at this absolutely underestimated composer closer. 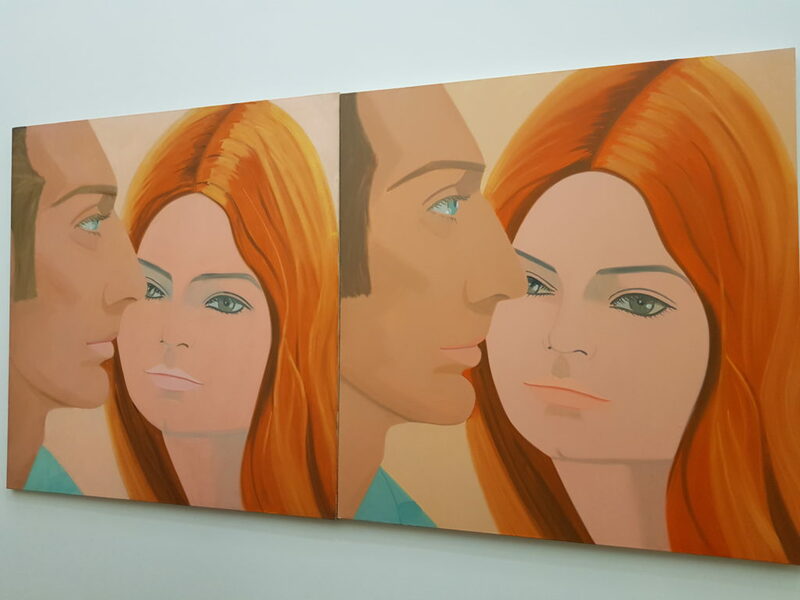 One sunny afternoon I decided to go to the Alex Katz exhibition in Munich. I expected to see many beautiful portraits, maybe a few landscapes. It turns out the exhibition at the Brandhorst Museum offers both. Without being a huge retrospective it does give a proper impression of what his work and artistry are about from his early days to today. What really made this show interesting to me though, was that it confronted me with one question: what makes a portrait? 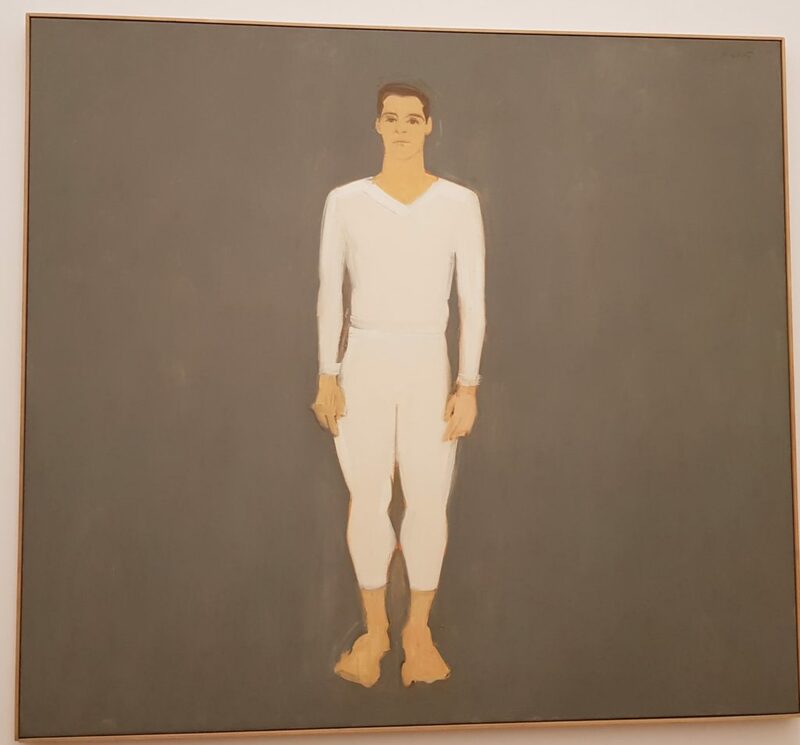 I couldn’t help feeling while walking through the exhibition that Katz’s approach to portraiture whether in the traditional painting on canvas or the cutouts oil on aluminium figures doesn’t quite comply with my idea of what a portrait is. Why is it so? Are these portraits? No expression, no content, no form? No expression, no content, no form? Could that apply for his paintings? The word Robot comes to mind when I read these words, but that is really not what Katz’s painting is about. These are no machines on the canvas. There is an aesthetic, a beauty which shines first and foremost. And yes, this beauty does have to do with the people in the paintings. It is a physical beauty, a superficial pleasing to the eye with perfect clean faces, no wrinkles to be found. Katz is a very elegant and self-conscious man. Here is someone who at the age of 91 still does 4 hours of physical training a day! No wonder Katz is also said to be close to fashion. “I’ve always been interested in fashion because it’s ephemeral.” he says. 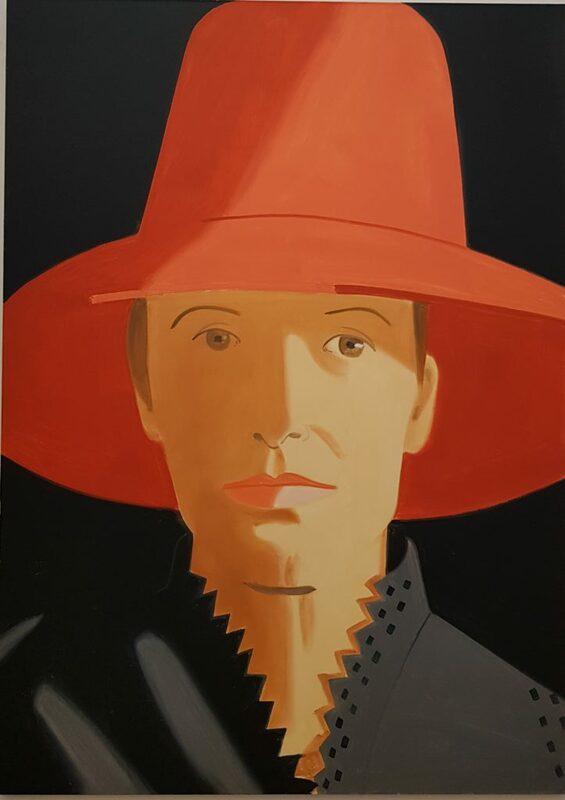 In his later work “Red Hat” (Alba) of 2013, the hat takes almost half the canvas. This is a gorgeous painting in my eyes, yet not because of Alba, but because of the composition. Alba’s face is present but without emotion, such as a model on the catwalk. She serves her purpose. Is a beautiful woman, but this isn’t about her, it’s about the hat she is wearing. 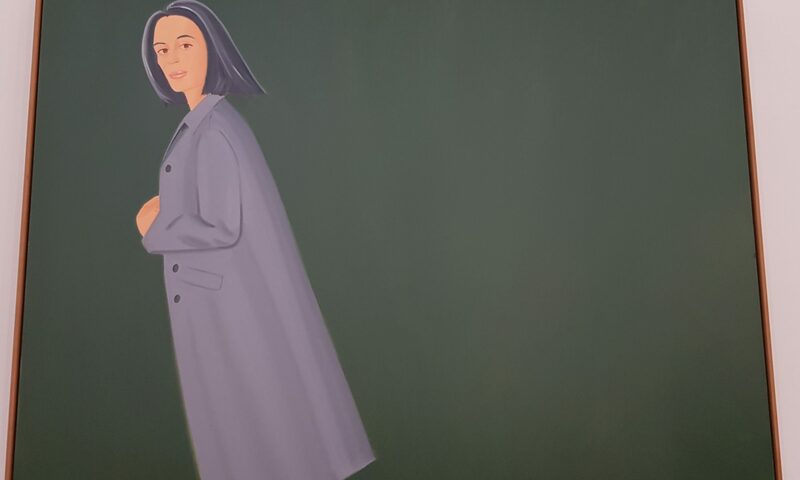 Or in “Grey Coat” (1997), where the coat covers most of the figure, Alba’s face turning around to look at us in a direct yet distant manner being secondary to the actual full painting. Here I feel again Katz’s fascinating use of the composition. Just like in photography. The figure is set in a diagonal on the left side of the canvas which in turn means most of the canvas is occupied by the monochrome background. Just beautiful. His work has also been said to be close to the cinema. In “eyes closed, eyes open” (2004), one sees this clearly. The same person side by side has once her eyes open and once the eyes shut. Like an attempt to create movement through stills. Again a very beautiful painting, but a portrait? Even though the painting is about a figure, a face, in this case that of Vivien, it seems to me to be just too perfect. She is almost like a fashion doll. Saying that it doesn’t take away from the beauty of the work. And that is quite incredible, to see that a painter can achieve that. 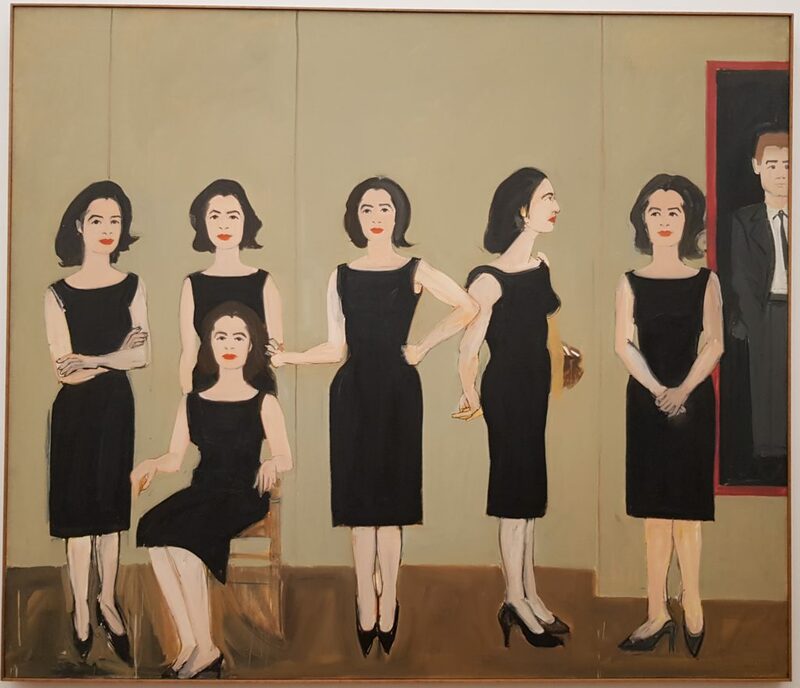 In “The Black Dress” (1960) Katz uses the image of Alba 6 times standing in various ways and also sitting, always dressed in the same black dress, yet all 6 figures are interwoven in a scene. In this painting, we do have a floor, some wall panels, and a section of a portrait by Katz. But the depth of field is still reduced to its minimum. And the person? Alba? Well, we see her 6 times in different poses, her facial expression though is secondary to the actual physical connections created by the composition. The painting stands strong with a story but not a personal story. Maybe this feeling is created by the technique Katz uses for his big paintings. In the early 1960s, as he was beginning to paint bigger, he started using the cartoon drawing technique from the Renaissance. For this, he makes a large line drawing with holes pinched along the lines. A small amount of charcoal or graphite go through the holes on the canvas and create thus a faint outline for his composition. This allows him then to repeat a figure or to repeat a whole painting just like in “Laure and Alain” (1964/1991). The same painting twice, put together side by side as one. The original was done in 1964 and then repeated again in 1991. The only difference is that in the later version his craftsmanship has been mastered expertly meaning that for instance the light in the hair of Laure is more subtly painted. Both figures seem in their own world, Alain is in profile, Laure frontal. So, is this a portrait, Mr Katz? To go back to my original question: are these portraits? Well, my first reaction says they are not. I feel a portrait is something personal. It is first and foremost a vision of a person, of the whole being with wrinkles or tired eyes. We all have different visions, of course, we all see things with our own eyes, and in my opinion, a portrait is the vision by a painter of a person’s soul. In Katz’ paintings, I feel it is about the painting, the aesthetics of the painting, the colours on it, the composition of it, the beauty of it… so really the people on the canvases are “just” models for the work of art Katz produces. Saying that, when I think of today’s obsession with looking young and being self-obsessed: the selfies, the likes and the Influencers’ “look at me” pose, well maybe Katz is just reflecting that and is after all making the portraits of today! I am not a regular Ballet go-er, but since becoming close friends with a Ballerina I have had the opportunity to get to know this world more and more. It is true that sometimes this art form can seem a little mannered. 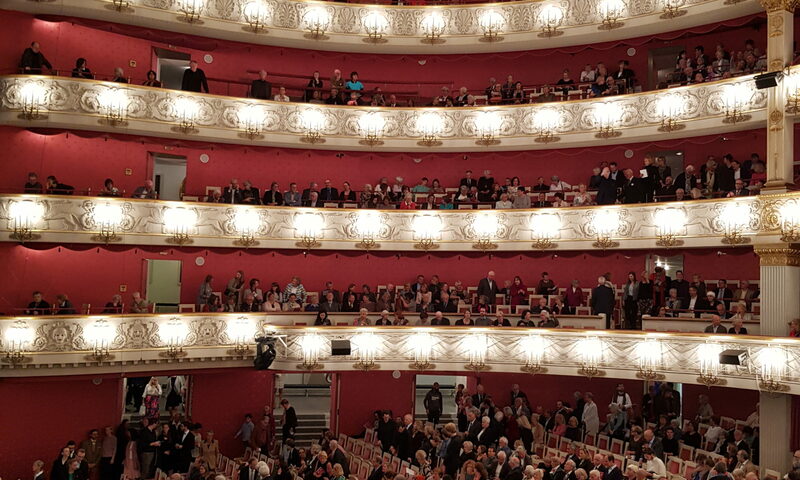 All the tutus, the men in tights, the pantomimic gestures, the point shoes… But on an evening such as this one at the Bayerische Staatsballet, I am reminded that thinking in this way is being totally unfair to this art form. A story such as Anna Karenina‘s can be very movingly and clearly told in a non-kitsch way, with pointed shoes and wonderful dancing. I had read the Tolstoi novel years ago and only recalled vaguely bits of it. So I did not really know what to expect. I found myself going down memory lane: the train, the balls, the winter, the summer heat in the fields and of course the love affair and its consequences leading to Anna Karenina’s delirious state. They all came back to me! That Russian fin de siècle atmosphere in all its opulence, how wonderful! No big red curtain when coming in. It starts with a steam engine soundtrack, the train is rolling on, the dancers set in a freeze with a black and white video of a close up of the train. The atmosphere is set! We are at the train station. The place where Anna Karenina and the Count Alexej Wronski first meet. The choreography, by Christian Spuck, allows all scenes to be so clearly recognisable with the only help of a curtain in the back and the dancers’ costumes and props ( set by Jörg Zielinski and Christian Spuck). For me, there are two major aspects which make this evening magical: the scenic and atmospheric changes, with just a few movements and the music! Just a few moves and we are at the horse’s races. This staging reminded me of a very similar scene in the film “My Fair Lady”. The whole atmosphere and stage changed in a couple of seconds, suddenly the public is on the tribunes. It is watching the races through binoculars. i.e. hands. I just love this kind of magic! One knows what is happening and yet one doesn’t have everything so obviously pointed out. The men working on the rail tracks is just another such scene. One can feel the heat, the sweat. The imagination is allowed to take over and to make its own associations just through movement. It’s an open stage, nothing more. The love scene between Karenina and Wronski is two dancers… Just dance, with an incredibly intense and passionate, but also destructive and violent love act. The desperation of Karenina to see her son, her undecisive husband who then gives in to the overhand of the Countess Lidija Iwanowna is beautifully told without any unnecessary prop or set. Wonderful! The second factor making this evening magical is the music. A fabulous sound landscape, a mixture between tracks of steam engines and hammering, orchestral sections with or without piano, solo piano pieces or even piano and voice songs. A mixture of romantic Russian music at its best, modern music and soundtracks. Sergej Rachmaninov, Witold Lutislawski, Sulkhan Tsintzadze and Josef Bardanashvili are the composers. The piano has a leading role with Adrian Oetiker giving strong renditions of Rachmaninov’s third concerto among others. Such a wonderful choice and use of music. It is an incredible wide scope of sound images all enhancing the atmosphere and the story. I am thrilled! Of course, all this would be of no use without the dancers, and they are superb! Ksenia Rhyzhkova just is Anna Karenina, Matthew Golding the Count Wronski, Jonah Cook, and Lauretta Summerscales are the so charming and sweet couple Kitty and Kostya, and the couple Dolly and Stiwa are danced by Javier Amo -whose presence I truly enjoy- and Elvina Ibraimova. Making the evening complete and perfect are the costumes by Emma Ryott. I have to say, this was a truly fabulous evening! It reminds me of what theatre, is about: getting the public’s imagination going, never getting boring, keeping one involved with what is happening on stage and bringing up emotions! Bravo! On a grey November Sunday morning I followed an invitation to hear a chamber music matinee in the Allerheiligen Hofkirche in Munich. It has been absolute ages since I have been to a string quartet concert. Coming from a musical family, with a cellist as a sister I enjoy chamber music, especially having played the violin as a teenager. So my knowledge of the repertoire is pretty good, even though I am no expert. The program, however, offered a new hearing for me: Béla Bartók‘s String quartet Nr.5, Sz 102. That got my interest going. This is such a wonderful venue, that I must write a bit about it. The Allerheiligen Hofkirche was a Catholic church and it was built between 1826 and 1837. 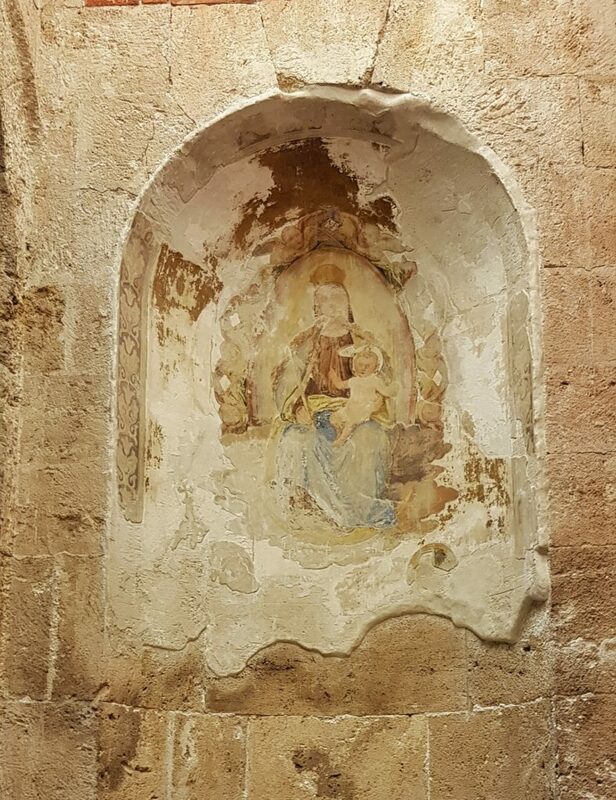 Following a visit to Palermo and the admiration of inner frescoes there, the then crown prince Ludwig decided to have a church built in a similar style as part of his Residenz. Leo von Klenze, the architect followed the crown prince’s wishes, extending his inspiration to the Marcus Dome in Venice. The interior with its vaults covered coloured frescoes was built in a Romanesque style while the facade was more gothic. This was the first church built in Bavaria after the secularization in 1803, hence its name “All Saints”. During the Second World War, the church, the Residenz and the National Theater were very heavily damaged. Unlike the Residenz, it was left to deteriorate for years before a decision was taken. First wanting to tear it down, the city then decided to renovate it following a huge uproar by the citizens of Munich. The renovations started in 1972 under the leadership of Hans Döllgast. After his death in the 1980s, restorations continued with new cupolas and work on the facade. Then from 2000 to 2003 work on the interior was taken over by the Architects Buro Guggenbichler und Netzer before it was finally opened to the public. The damages made to the church are visible as a testimony. The frescoes are left in their spare segments, the pillars have lines where they were put back together. All this was done very respectfully and beautifully. 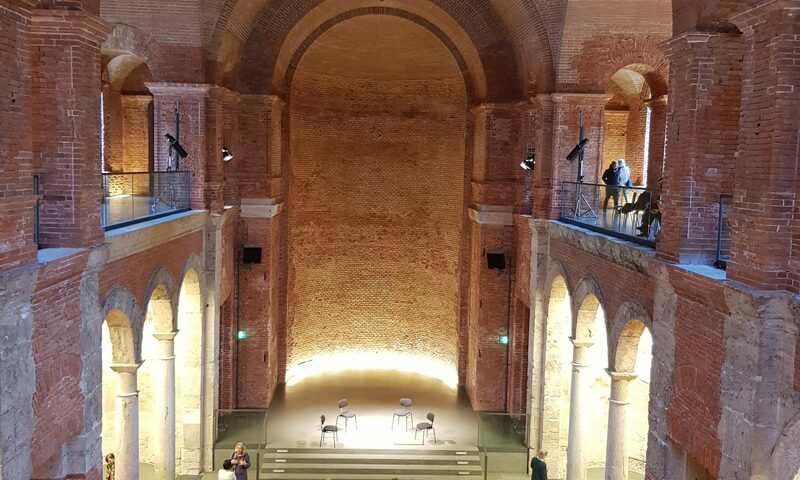 This gives the hall a wonderful atmosphere, which is enhanced through the warm and indirect lighting and through the red bricks. And so it is that the Allerheilgen Hofkirche became a Hall. It is no longer used as a church but as a concert venue, it’s acoustic being excellent, and as a venue for special events. Beginning this program is Dvorák’s string quartet Nr. 14 in A flat Major op.105. The cello starts with a slow introduction. It is leading the others before moving on to an allegro appassionato movement. Dvoràk started writing this quartet when leaving the United States after 3 years there to move back to his beloved Prag. This is his last string quartet. Wonderful piani, colours, interaction, all played sensitively and beautifully by the musicians. The quartet players are members of the Bayerische Staatsorchester: Johanna Beisinghoff, Julia Pfister, Monika Hettinger and Anja Fabricius. It is a pleasure to watch them play. The second half is Bartók’s string quartet Nr. 5 Sz 102, and this for me is a discovery. I never really thought of Bartók’s music as being full of humour. This piece changed my mind fully. I just love the pastiche classical section in the last movement, the playing with “out” of tune effects, the glissandi and jazzy rhythm in the cello pizzicati. Bartók only needed a month to compose this piece in the summer of 1934. The first performance was then on 8th April 1935 in the Coolidge Auditorium in Washington. This work has all that is so typical of Bartók, the accented rhythms, the complex harmonies. It is also so playfully modern experimenting with sound effects, sound landscapes. A wonderful work. Walking out in the grey November mist with the afternoon ahead of me, I couldn’t help but smile. The impressions of the morning were going through my mind… the discovery of Bartók’s quartet, the excellent playing of the musicians, the so wonderful atmosphere of the Allerheiligen Hofkirche… All this made it a wonderful start to that Sunday. A little while ago I had some time to spend in Munich before catching the train back home. 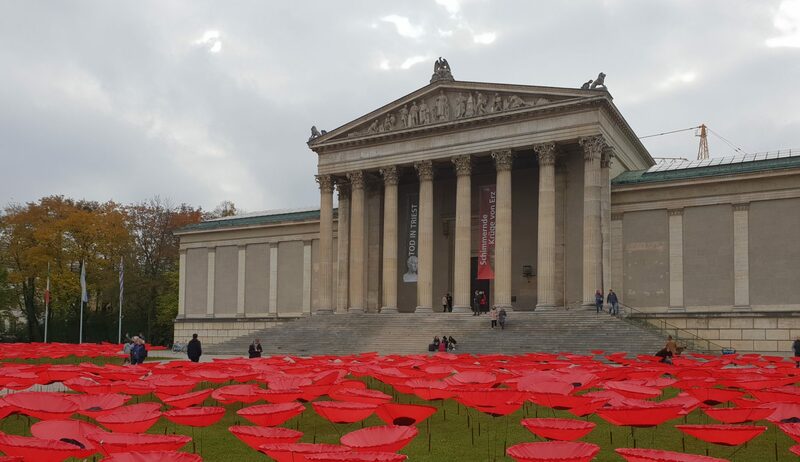 As a Greek who loves the ancient Greek element in Munich‘s buildings and museums, I was planning to go see the Greek landscapes in the Neue Pinakothek. King Ludwig I. commissioned them when his son Otto became the first King of Greece in the 1830s. But then I happened to scroll through a cultural magazine and discover the announcement of an anniversary exhibition commemorating the 250th anniversary of Johann Joachim Winckelmann‘s death. The German Hellenist, who many consider as the founder of Art history and modern archaeology, was murdered in Trieste in 1768. I changed my plans and instead paid Munich’s Collection of Classical Antiquities (Antikensammlung) a visit. 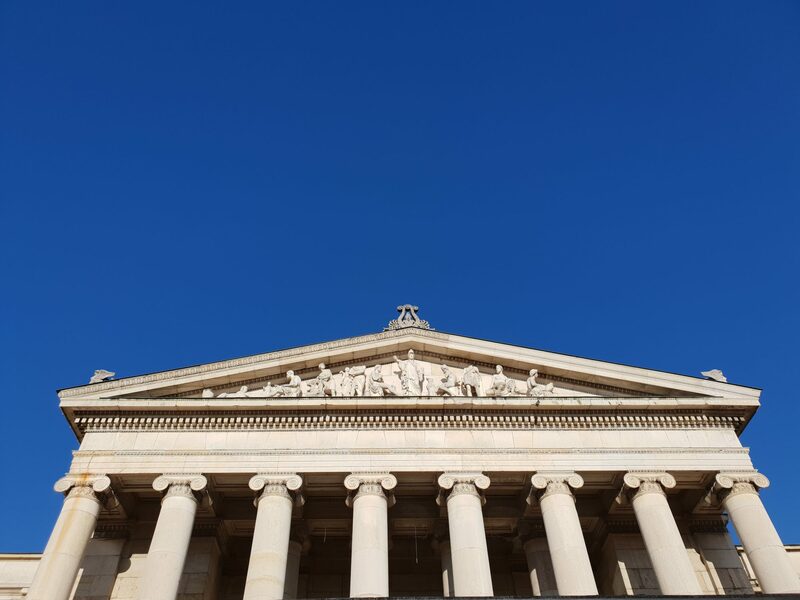 The State Collection of Antiquities on Munich‘s Königsplatz contains an exquisite collection of Greek, Etruscan and Roman works of art and everyday objects. It provides a good overview of ancient art, from the Cycladic Culture of the Aegean region in the third century BC up to the late antiquity in the fifth century AD. 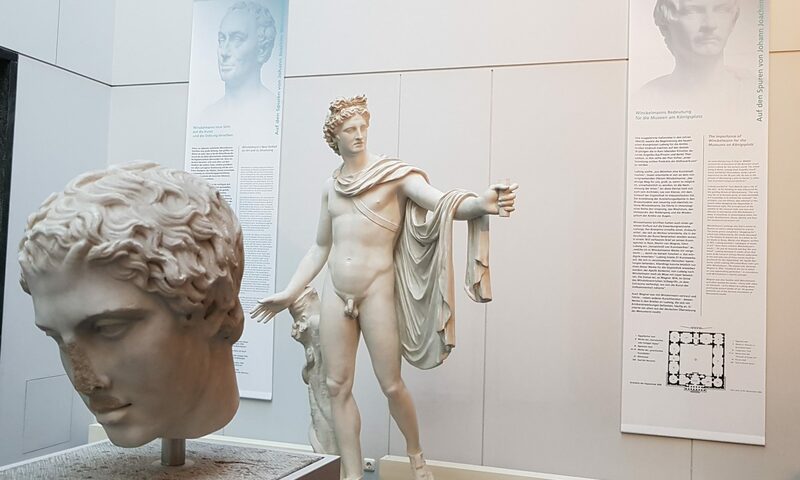 Together with the Glyptothek, which is situated opposite the Antikensammlung and presents sculptures from the same period (currently closed for refurbishment), it showcases King Ludwig‘s I. passion for classical antiquity. The Bavarian King‘s wish to turn Munich into a city of the arts was inspired by Winckelmann‘s guiding principle: „The only way for us to become great, or even inimitable if it is possible, is to imitate the ancients.“ When Ludwig I., not yet King, commissioned his art dealer in Rome to acquire works of art as to enlarge the collection of his family in the early 19th century, he listed 21 pieces that Winckelmann had discussed in his major work, “History of the Art of Antiquity”, written in 1764. Winckelmann had developed a new historical structure of Ancient art from its beginnings to its decline, based on the chronological sequence of various styles. In Ancient Greek art, he saw the fulfillment of the task art should have in his opinion: the depiction of ideal beauty. He was the first to rely more on his own perception of ancient objects rather than the study of ancient sources as well as the first to view and interpret Ancient art through the eyes of Greek mythology instead of Roman history. An exhibition on somebody who, by profession, writes about art rather than creating works of art, obviously consists mostly of information around his person and his writings. In the two halls of the Antikensammlung currently dedicated to the famous 18th-century German scholar, well written, informative texts are used to emphasize on Winckelmann’s importance for the reception of Ancient art in Central Europe and his influence on the future King Ludwig I. of Bavaria. A few sculptures or copies illustrate the works of art which became known to a wider audience through Winckelmann’s writings. 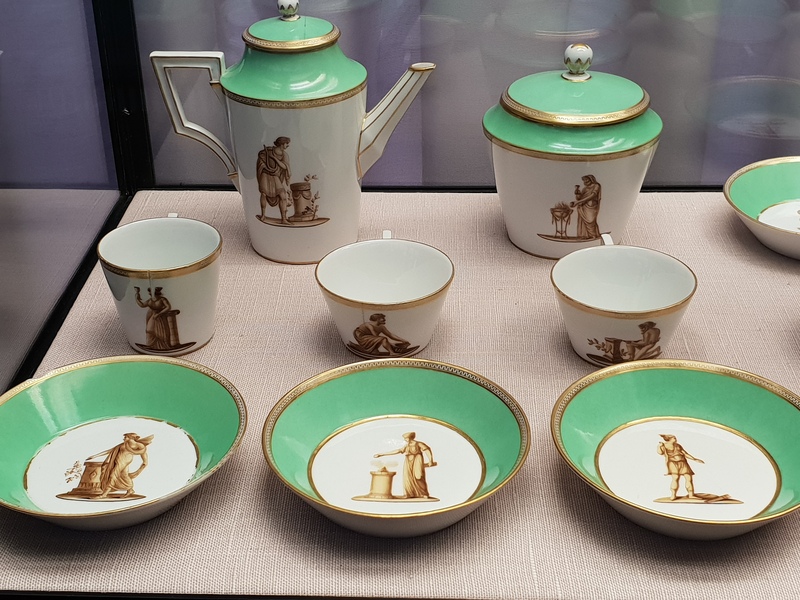 Period furniture and chinaware inspired by Greek art complete the presentation. 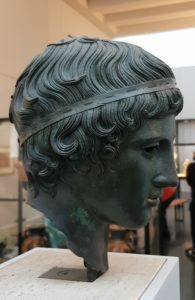 Winckelmann’s sensory reception of ancient objects and belief in the liberal ancient Greek spirit had a big impact on Western writers, philosophers, sculptors, and painters. One of them was Swiss painter Angelika Kauffmann who became sought after as a portraitist after having portrayed Winckelmann in 1764. The presentation sets a second focus on the Neoclassical artist who specialized in historical paintings, finding her inspiration in Ancient mythology and participating in the reception of Homer. Influenced by Winckelmann’s less philological approach to Ancient art she chose her topics so as to evoke a higher empathy in her viewers. She thus broke with the tradition of the strong ancient hero. This, as well as her fascination for strong ancient women, display a notably female view on the Ancient world. 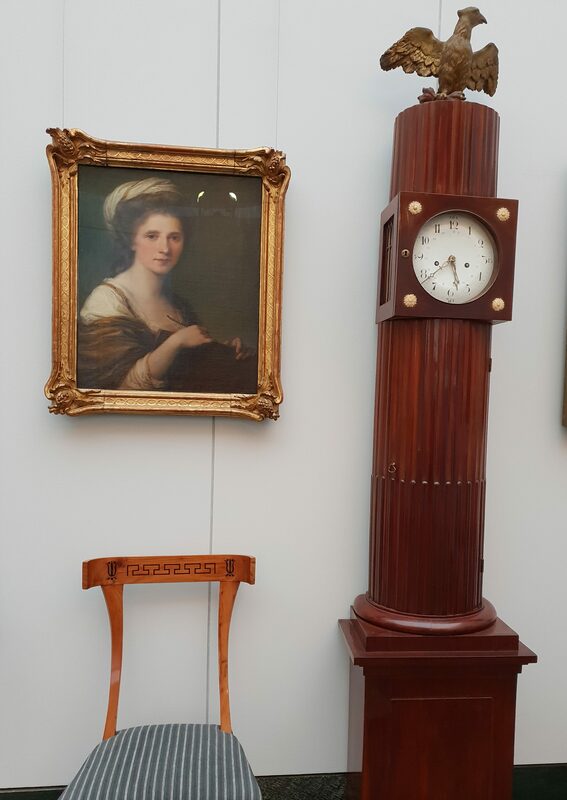 The visit to this exhibition awakened my interest in Winckelmann and his writings, which were perceived as a revelation by his contemporaries. The German scholar became the spiritual father of German Neoclassicism by insisting that Contemporary art should imitate Ancient art. His work on Greek art nourished the upcoming Philhellenism and thus contributed to the Greeks‘ uprising after 400 years of Ottoman rule. But as proud as one might feel about the achievements of one’s ancestors and the interest later generations showed in them, I can’t get rid of the thought that Winckelmann’s approach also contributed to a strongly idealized view of Greece by Central Europeans, a picture that today’s Greece has trouble corresponding to.